About.me is a FREE website that allows you to create a personal page in minutes with no coding required. I recently made an About.me page of my own and found it very easy link all of my information to one spot. I include my About.me page underneath my signature on emails and on the top right hand side of this blog page. This gives quick access to all of my information to anyone who views my page. You can include a stunning backgrounds; for an example, a pictures that defines you or simply add a color. About.me also allows you to link all of your important sites and social media accounts. 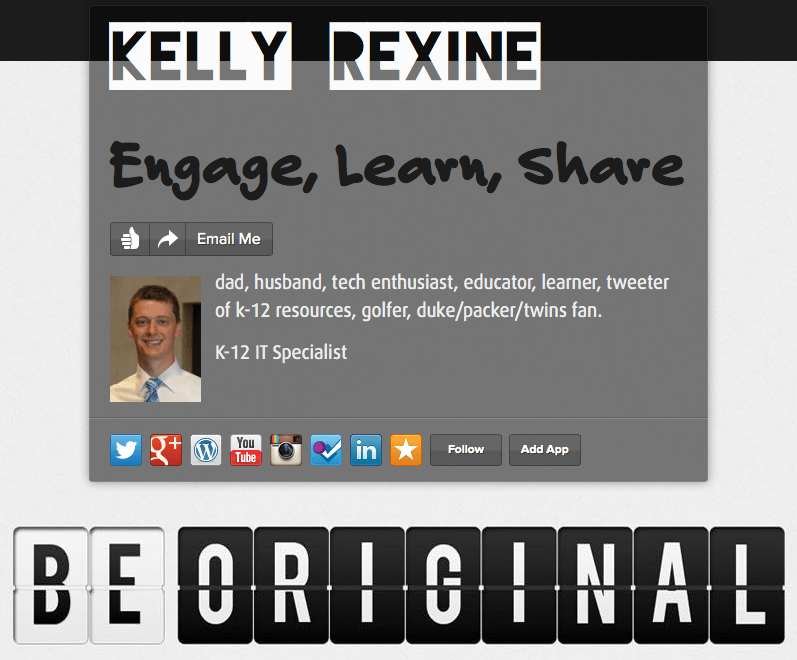 Teachers can create an About.me page and give this out the first day of school so each student knows a little bit about their class teacher. Students could also use this site to create a quick bio about themselves. Introduce About.me to students as an online business card. To sign up you will simply need an email address. I encourage you to check out my About.me page by click on the image below or the linked image on the top right side of this blog.